The long awaited study of Jose Mourinho’s tactics is finally here with an extensive analysis of his Real Madrid team’s 4-2-3-1 formation. The attacking phase was key for Real Madrid and the main features were creating width, maintaining superiority in numbers around the ball zone, long diagonal passes, in/out swinging crosses from the flank and Ronaldo’s efficiency in front of goal. The defensive phase was key for Real Madrid and the main features were applying pressure near the opposition’s penalty area to regain the ball, aggressive zonal marking across the whole pitch, using intelligent positioning to double mark opposing players and Xabi Alonso’s great tactical awareness. Terzis Athanasios is a Tactical Professor of Football and has compiled an extensive assessment of Real Madrid’s defensive play after over 1000 hours of studying all the games from the 2011-12 season. Real Madrid won the La Liga title, beating Pep Guardiola’s Barcelona team, one of the most successful club sides in history, by 9 points. 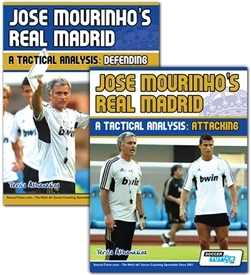 Both Attacking and Defending books starts with the characteristics of the players and builds into a comprehensive overview of the attacking and defensive tactics employed with clear diagrams and detailed descriptions. This gives you a unique opportunity to use the same 4-2-3-1 pattern of plays that Jose Mourinho's used for his winning Real Madrid team.. Integrate them into your sessions Now! Strategies used to counter specific formations (the 4-4-2, 4-2-3-1, 4-3-3, 4-3-2-1, and the 5-4-1). Don’t miss this unbelievable chance for you to learn Jose Mourinho’s 4-2-3-1, how the team play and adapt their tactics to all conceivable situations. Their attacking and defensive play is key to their great success and the blueprint is available right here for you to learn and apply the same tactics for your team. This is a very good analysis and gives you a chance to see what when where and most importantly why of many many situations to help you create your own sessions. By: Wong Gargine from JDT, Malaysia. how to attack and defend. Very useful thougts and tips! Great analysis!